After reading the headline, you might think: "who are Human Bones?" Yes, it is a nice band name, but we're talking real human remains here: femurs, ribcages, tibias etc. 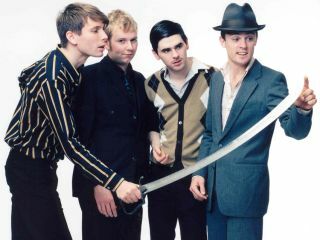 Frontman Alex Kapranos has spoken about the 'entertaining' recording process of Franz Ferdinand's long-awaited third album: Tonight. "I remember we were working on a song called Kiss Me, and we wanted to have a real dry, percussive sound in the chorus," Kapranos told MTV. "We had this skeleton in a box that just ended up sitting in the corner of the studio, and we decided to experiment with it. [Guitarist] Nick [McCarthy] had the hands and was clapping the bones together. [Drummer] Paul [Thomson] was working with the pelvis bone and a femur." "We put the teeth in a glass jar and rattled that about. We smacked the ribs together and we got this really weird, fucked-up kind of a sound that was wicked. I can't think of any records with human bones on it." Skipping quickly past the Tibetan monks who made drums from children's skulls, Tom Waits' 1992 Bone Machine LP did, allegedly, feature human bones. Played by Primus bassist Les Claypool, no less. This boney percussion sound went on to influence Muse's Origin Of Symmetry track, Screenager. You can watch a video of the band's drummer Dominic Howard whacking some bones together in the studio. Whether they're human, or dinosaur, remains to be seen. The rest of Tonight's recording process follows suit: "One of the most exciting moments for me was when we were recording the song What She Came For," continued Kapranos. "We wanted to play with the Doppler effect - like when you have an ambulance passing by, and the siren changes tone as it approaches. I love that sound, and one of the rooms we have in our place in Glasgow was part of an old town hall, so it has 50-foot ceilings." "One day, Nick climbed up to the rafters and lowered a microphone cable down to the ground. We put the guitar amp on its back and turned it up, full whack." Producer Dan Carey also got stuck in by throwing the microphone across the studio while recording: "The sound we ended up with sounds like a cross between a guitar and a World War II dive-bomber - It's wicked."